• 16 pages & 37 high-resolution grayscale images. • Serial number ranges with dates from all manufacturers. The US Rifle Caliber .30 Model 1903, is an American clip-fed, 5-shot, bolt-action service rifle used primarily during the first half of the 20th century. It was adopted as a US Military Rifle on June 21, 1905. After being on the receiving end of the Mauser Model 93 rifle during the Spanish-American War, the US War Department performed extensive studies to replace the US .30 Krag rifle. Even though Springfield Armory used a two-piece firing pin and other slight design alterations, the 1903 was in fact a Mauser design and this resulted in the U.S. government losing a law suit and was forced to pay $200,000 in royalties to Mauser Werke of Germany. 1905: By January, over 200,000 rifles produced. 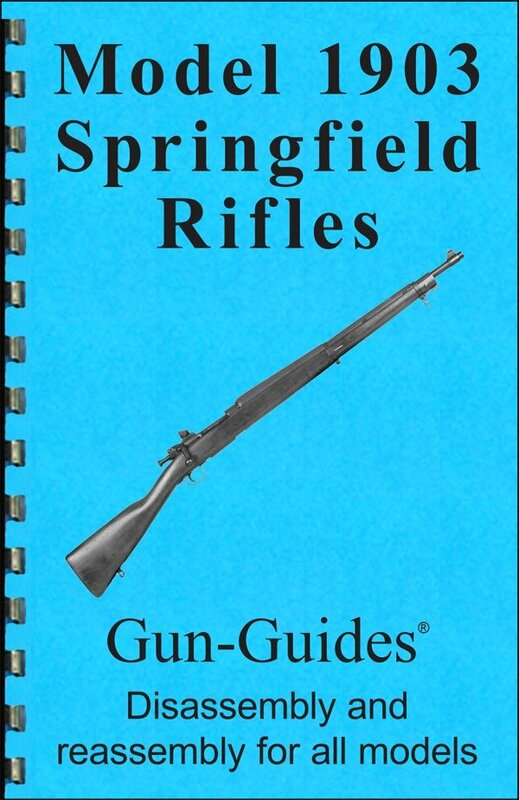 WWI: 843,239 rifles produced by Springfield and Rock Island. CAUTION: Due to inconsistent heat treatments, low numbered receivers (Springfield Armory below 800,000 and Rock Island Arsensal below 286,506) should NEVER be fired under any circumstances because of the risk of serious injury or death. 1903 Mark I: Toward the end of WWI. A cut in the left side of the receiver and stock were added to accommodate the Pederson Device (semi-auto .30 pistol caliber). caliber rifle in artillery pieces. 1937: The 1903 Springfield is "officially" replaced by the M1 Garand. 1941: In September, Remington began production of the M1903 with serial number 3,000,000. Milled parts (marked with an "R") were replaced with stamped parts at about serial number 3,330,000. Model M1903A4 is a modified 1903A3 to be used as sniper rifle with telescopic sights. The rifle was sighted for 2,500 yards and had a point-blank range of 500 yards. The maximum range of the ball cartridge, when elevated at an angle of 45°, was 4,890 yards or 2.77 miles. The rifle could fire at a rate of 20 shots per minute. The 1903 adjustable rear sight was set for 546 yards. The 1903A3 rear sight was an aperture sight adjustable both for elevation and windage.